There was a time when I thought Candyland was a tool of parental torture. I became mysteriously busy whenever my kids wanted to play. Sure, I’d naively picked it up at some point when my oldest was a toddler and I still viewed every milestone as a cause for celebration; hey, she’s old enough to play a board game now! Let’s get Candyland! Smarter parents than I would confide their tips and tricks. “I hide all of the location cards,” whispered one friend. “We just do the colors. I tell them I have no idea what happened to the other cards.” Another told me, “I just make sure they’re in there in order, so they never get sent backwards.” It seemed like a lot of work, just to play a board game that’s supposed to be simple. But I quickly came to understand what drives parents to these extremes. For one thing, Candyland never ends when played “correctly.” And the only thing more mind-numbing than Candyland is playing Candyland for over an hour. But more to the point, small children aren’t known for being, shall we say, entirely gracious when they don’t win. This is expected, of course. Candyland is kind of the training wheels of the board game world, and the expectation is as your child grows and matures, their ability to tolerate the distress of losing will increase. Weeeeeeeeeeell. I’d love to tell you that both of my kids are great sports, but I’d also love to have my own personal unicorn. My son, in particular, is a good illustration of that whole “asynchronous development” thing you often see with kids on the autism spectrum. At 13, his academic abilities are well beyond that of most of his peers, but his socio-emotional functioning continues to lag behind. Much of my son’s self-image is built on being “smart,” without a full understanding of the equal importance of other qualities as well. He struggles with a need to be infallible. So losing a game? That’s not only unbearable, it probably was because you cheated or the game is just stupid or some other reason wholly unrelated to him. In other words: He’s an amazing kid in countless ways, but he’s also a terribly sore loser. We’ve been working on this with him for years. I’ll confess a frustration here which I know isn’t reasonable. I know this is harder for him than for a neurotypical kid. I know he’s not a bad or mean or ungrateful kid. But when there’s a familiar post-game meltdown—albeit now happening to my gangly man-child who can no longer pass for a little kid—I sometimes despair of him ever learning to be a gracious loser. I’d love to skip the meltdown, of course, but the bigger issue is that this is starting to feel like a giant milestone, one that sits squarely between my child and his ability to function in a world that is not always predictable and/or kind. “Sure, honey,” I said, before I realized the words were out of my mouth. A familiar feeling of dread crept up the back of my neck. I tried to shrug it off. But the last family game night we attempted a few months ago ended up with him storming off amidst declarations of how mean we all are, and I wasn’t eager for a repeat of that. We sat down and began playing. This is probably a good time to point out that even though my kids struggle with being good sports, I don’t believe in letting them win just to keep the peace, either. I’m not going to crush them and scream, “In your face!” or anything, but neither am I going to lose on purpose. We were about four moves in when I played my first really big word; I can’t even remember what it was, now, but I think it involved a Q on a double-letter score, and then the word crossed a double-word score, too. “That’s not fair!” he exclaimed, as I started tallying it up. I paused and raised an eyebrow at him. “I mean,” he amended, “that’s gonna be so many points and there’s only one Q and I’m never going to catch up.” He looked down at his tiles, morose. This is the point at which I would usually say something like, “If you can’t keep it together, we’re not going to play,” (probably with an audible sigh). Before I could say anything, though, his sister came and sat down with him and told him she’d help him, if he wanted. In the past, an offer of help would’ve been taken as an insult, but on this day—maybe because he’d missed her so much—he brightened at the suggestion. “You know,” I said, after I finished calculating my score, “part of what makes this game fun is that there’s so many pieces to it. There’s the luck component, because you never know what tiles you’ll get or where you’ll be able to play on the board. There’s the language part, where you have to know a lot of words. And then there’s the strategy piece, too, that has to do with where you play and how you try to anticipate your partner.” He nodded, but I wasn’t sure if he heard me, really, because he and his sister were busy rearranging his tiles and whispering. A few seconds later, he played CRAP amidst much giggling. Well, hey. Progress! I’ll take giggles and pseudo-swearing over meltdowns, any day. The game progressed, and as we played, we discussed board strategy, some. “See, I’m playing here to block this triple word square, see?” Or “I played that because it got me a ton of points, but now you could play here,” sorts of things. Eventually, he told me to “stop telling him what to do.” But even that exhortation was good-natured, so it was okay. The game lasted about ninety minutes, and I ended up winning by over a hundred points. I looked over the score, then pointed my pencil at him. “I won,” I said, noticing how the corners of his mouth drooped, “but let’s not forget that I’m a lot older than you, I’ve been playing Scrabble for longer than you’ve been alive, and P.S. I’m a writer so words are kind of my thing. You made a very respectable score, and more importantly, I had a lot of fun playing with you. Thank you for the game.” He smiled, and we shook hands. I am mostly still in the Candyland phase with my kids (all under the age of 6). My kids LOVE to play board games. When we sit down and play I tell them how many rounds we can do. The deal is I will play say 3 games of Uno, but if there is any whining about someone winning we won’t keep playing. I have only put the games away once. For the most part they are great sports about winning or losing. You could try keeping the score difference from the last time you played… Say you won by over 100 points. Then the next time you play, you start the game by -100. If you son wins by 10 points, then the next time you play together, he starts at -10. I love your posts about Monkey, because they give me such hope that my own Monkeyboy will eventually hit those milestones too. I am SUPER competitive when it comes to games. I am not above a little trash talking while playing Phase 10 or gloating when I go out yet again. But I try to keep it toned down to a fun level of banter, because really the best thing is laughing with my family over ridiculous answers to Scattegories even when I’m losing miserably. Aaah, he is a worthy opponent! I hope he continues his progress in this area. The timing of this post is amazing, considering my Aspie is currently sitting in his room, yelling across the house about how we all need to apologize to him for being liars and cheaters, because he lost a game yet again. Some days he can be amazing, other days, I worry he’s going to end up in prison. If it makes you feel any better, Meghann, this morning he came downstairs while the husband and I were in the middle of working on something, and after asking him three times to please stop interrupting us and just quietly get his breakfast, he walked into the other room and told his sister, “Mom just screamed at me to shut up!” When I pointed out that was a rather creative interpretation of events, he got even angrier. 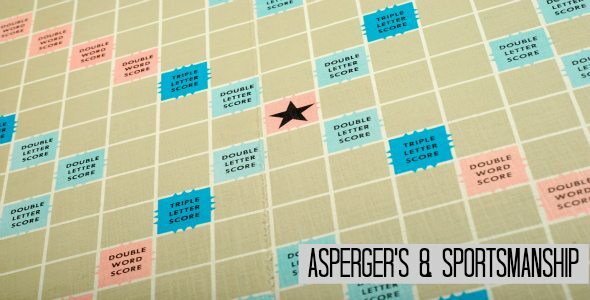 Yay, Asperger’s! I have the Dora the Explorer version of Candyland in my basement in it’s original packaging. It’s been there more than a year. I know my 4 year old daughter would love it, but I can’t work up the courage to bring it out. It’s crossed my mind to turn it into a drinking game, but I know that would be just wrong. You need to rope well meaning relatives and friends into playing with her. I have some great pictures of a Scottish friend decked out in “Pretty, Pretty Princess” jewelry. I’m waiting until his kids are a bit older before putting it on Facebook and tagging him. I have a picture of my FATHER decked out in the Pretty, Pretty Princess jewelry (playing with my daughter when she was around 5). It’s one of my favorites! I am so thrilled for Monkey! I imagine that it was VERY hard for him to be a good sport about the ending score. I would never have thought of offering my kids a handicap, but it is such a good idea!